With Business ConneCT, any authorised employee can act as an operator, connecting callers, handling messages and locating staff. The single user interface makes it easy to combine operator tasks with other work. 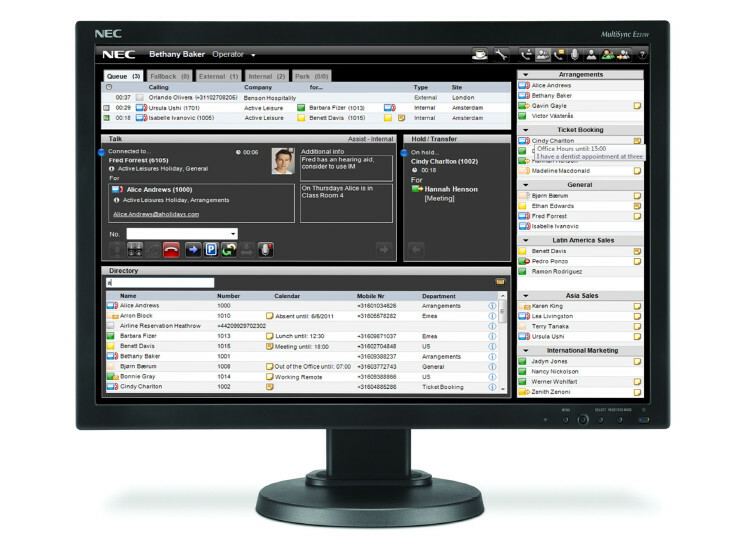 Business ConneCT Operator combines intuitive icons, an extensive name directory and various messaging facilities, offering professional Operator functionality to any user. Different queues show at a glance where a call is coming from: externall, internall, re-routed etc. Calls are always routed to the right person because operators can see which person the caller wants to reach and which colleagues with similar skills are available. Additionally, this comprehensive view on the queues allows operators to spot specific callers easily and treat them in a special way (VIPs, returning callers, etc). A specific application for operator is within the hospitality industry. Business ConneCT has a standard integration with the middleware solution of Tiger® and FCS® (the middleware is used to connect to a hotel Property Management System). With this integration Business ConneCT Operator has real-time information about check-in / check-out status of a guest, including additional extensive guest information like language and VIP status. Business ConneCT Operator is available for visually-impaired people by using an certified solution from Freedom Scientific which offers braille displays, voice guidance and screen magnification.